Home Donuts Donut or Doughnut? So of cos the first thing that i did today was to prepare em'.. dipped my donuts in dark and milk chocolate and bef i knew it.. i was munching on it with a cup of coffee.. ahhhhh this is heaven.. Packed half of it for hb afternoon tea at work.. called a cab and off we went to hb's work place.. took sonia to ELC and by half past 6.. we were already on our way to pick up some stuff fm BIY and Phoon Huat..
Stir ingredients A, knead until lumpy, add ingredients B, continue to knead until smooth elastic. Rest dough for 10 minutes.. divide dough into several balls weighing 40g each. Rest for a further 20 minutes. Punch a hole through the middle, then fry until cooked. Drain. Chill. Dip one side surface of the donut in the melted chocolate, sprinkle almond. Place donut in fridge to harden chocolate..
My way: I dumped everything in my BM accordingly of cos.. click on ON and after one hr and 10mins my dough was done.. gave my dough a light punch and divided my dough into several balls.. let it sit for another 20mins bef punching a hold thru the middle of the donut.. fry till cook..
Rimaa...i nak yg cekeletzz tu yeaa,..haha. sebijik cam Big Apple...so far ai wat donut sekali jer by hand...cam nak tercabut tgn uli tu adonan..now dah ada BM, kok terperuk plak..
Pagi pagi lagi dah ada cerita donut. 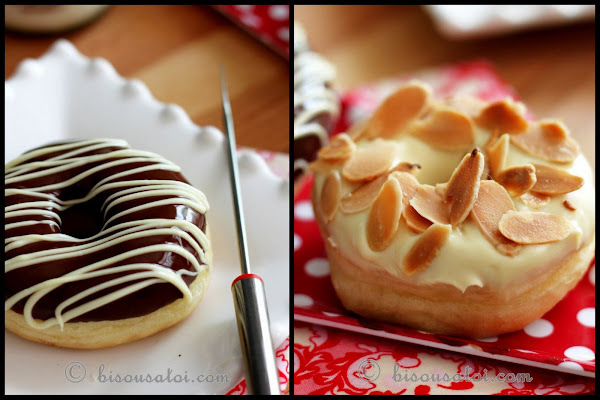 Ngileerr aje tak dapat makan donut u buat ni..hehe..
yummy, yummylicious and yummylism..apa lagi..harras sungguh donut ini...huhu! 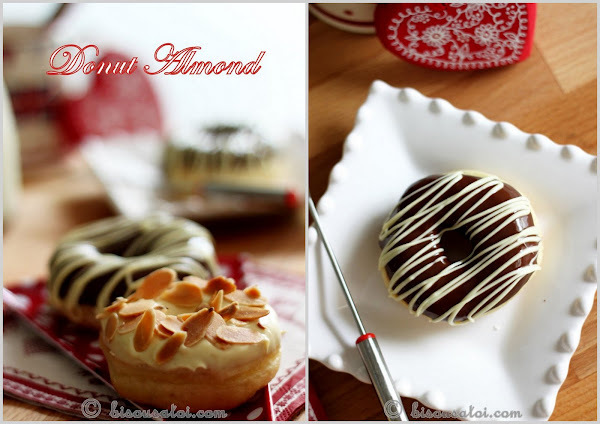 kak rima....cantik la donut...mas pun nak donut durian satu......yummy..
Ni doughnut bukan sebarang doughnut...doughnut w/ luxurious chocolate dip ..... ada class U. Dah lama tak buat doughnut. I'll definitely give this one a try esp with this chocolate. Yumm..So berapa u TERmakan? lol. awwwhhhh.... urs look yummier than the "super uber famous donut place" ones. 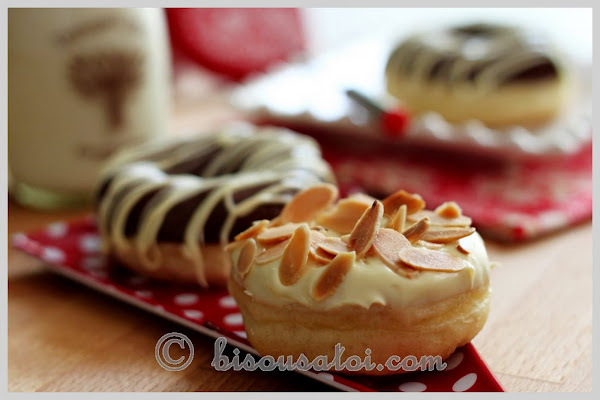 I loveeee doughnuts but seldom makes them coz my mum dont like em. But looking at urs, oohlala.. will definitely make them this weekend lah Rima. "sedap Ma" .. as cute as those donuts. 1 tsp salt only right? 200g White Cooking Chocolate - melted and 100g Almond Slice - roastrd are used for topping kan? I'm confused since it's donut almond and wondering whether u add almond to the dough. I have been looking for a doughnut recipe and I'm sure this is going to be good. so far, your recipe never fails me. tried your sicilian orange cake and it was yummylicious.my 3.5 y.o. son loves it so much. thanks rima. If dah sampai ngiler baik u pi beli kat luar .. but kan honestly.. tak sama macam kita buat sendiri.. itew chocolate u can dip lebih lebih and of cos u get to use good chocolate lah as topping..
Hehehe harus di buat.. i guarantee u will like it! 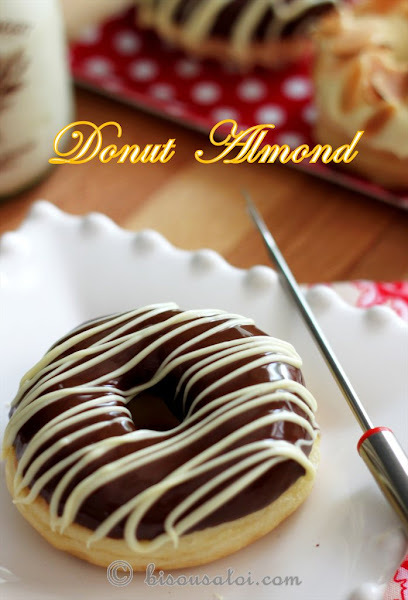 Alamak tadi Izah also ade mentioned donut durian.. memang harus akak kau pi beli and taste it..
Hehehhe baru 2 pcs.. semalam makan yg chocolate.. tadi pagi makan yg almond.. cukup lah tu.. yg balance tu kat freezer.. half fry.. this weekend i will just add topping to it for my family members..
bestnya kak rima, saya baru je pas mamam yg serupa cam ni(almond doughnut) from big apple last weekend..hehe..
craving for doughnut@donut now. i mean NOW! 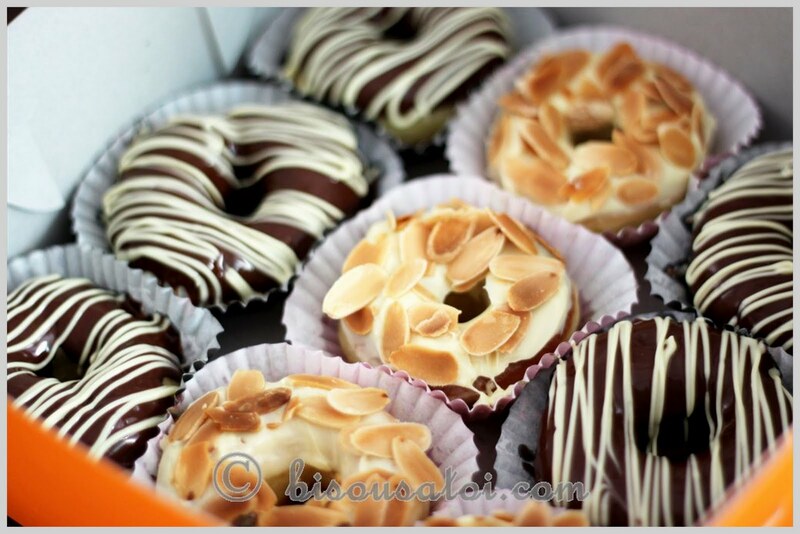 kak, u r so amazing in making my stomach berdondang sayang.. hehe..
these donuts look absolutely gorgeous!! beautiful pictures too! K rima.. Your doughnuts look absolutely yummy! And your skills make them perfect. I'll must try this..
How are you today dear? Hope you're recovering fast. Your doughnut is perfect. I like your chocolate coating. Can reveal if there is any trick to melt chocolate, how come yours is so shiny. Hi Rima, you mentioned you kept some half fried ones in freezer. May I know is it fry those again after thaw? How's the texture then? I have try poking a hole before frying the donuts but it deflates the dough. Pls help me as my children loves donuts very much. Thanks Rima! This is what i will usually do.. i prepare my donut and then semi fry em.. half fried.. dry them on paper towel and keep them in my tupperware.. i dont freeze it as we are crazy over it.. once u are ready to serve it.. u fry ur donuts once again and voila.. its ready.. Thanks Rima for your prompt reply. I just did some few days ago using another recipe. Am gonna try yours next time. Thanks for sharing and your tips. I used couverture chocolate for the topping.. simply melt it by using double boiling method. No worries Shal.. dah lama tak buat donut!